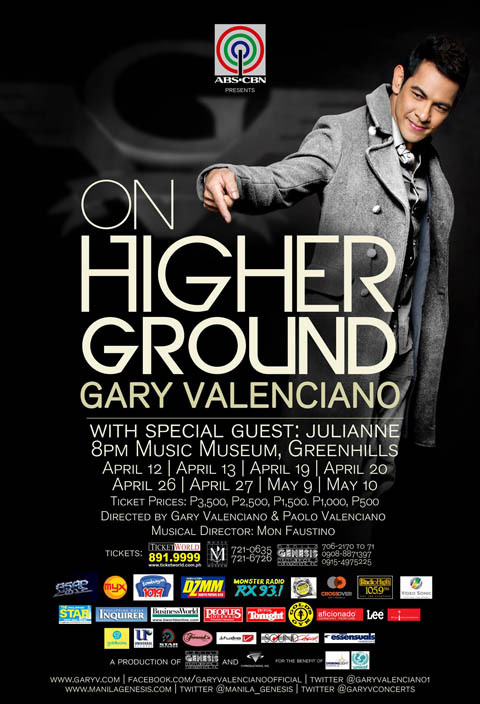 “Gary V : On Higher Ground” has four more shows on April 26, 27. May 9 and 10 at the Music Museum. The previous shows were considered a success for Manila Genesis Entertainment and Management. On a pocket press-con held yesterday Angeli Pangilinan, Paolo Valenciano, Quest, Juan Miguel Salvador and Kim Jones were all present to share the good news and updates about the concert. “Every show we’ve been adding” said co-director Paolo Valenciano. His showcased talent on directing the show received a lot of positive reviews and created a buzz from fans and music enthusiasts. The “video mapping” technique he used during the show is the latest technology ever used by a local solo performer here in the country. ETC reporter Kim Jones is the newest addition to Manila Genesis and she will have a special participation for the rest of the show. When asked what would it be she said “Im not going to sing but it’s SUPER! The number where you can see Quest performs is one of the most important part of the show that is why you need to be early when you watch the concert. Gary V always mentions on twitter not be late. It is truly a must that you all watch the opening. Among others, Juan Miguel Salvador is the most seasoned of all Gary’s guest artists. He shows his expertise and mastery of his craft as a musician in every number as lead keyboardist of the series. His number with Gary V is definitely a must see performance that shouldn’t be missed. Upside: Great! When I watched the concert I felt of wanting to watch it again!